Having trouble resetting your QuickBooks Admin password? Not a problem. The Automated password reset tool can help you reset it in QuickBooks Desktop. 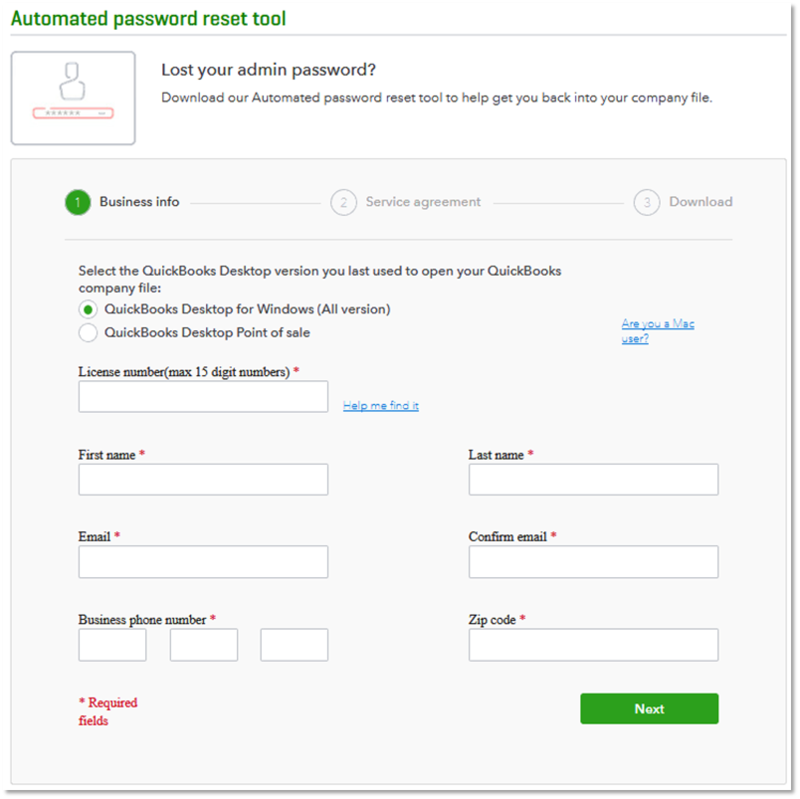 Download the Automated password tool for QuickBooks Desktop. Use this to reset your QuickBooks Admin password in any version of QuickBooks for Windows. Important: The version of QuickBooks you last opened your company file with must be installed on the computer you are using to reset the password. Fill in the QuickBooks license number and business info used when you registered QuickBooks, then select Next. Note: All information entered must match the information in our system including email address, main business phone number, and zip/ZIP code of the primary contact on the account. The access token will be sent ONLY to the email address for the primary contact. Accept the license agreement. The Automated password reset tool will be downloaded automatically (if automatic download didn't work, select Download now). Important: If it asks you to Run or Save the file, choose Save and save it to your Desktop. Run the Automated password reset tool, then enter the token number received via email. From QuickBooks Desktop Products drop-down, select the same QuickBooks version. Select Browse for Company File, then choose the company file that you want to reset the password for. Note: If you are resetting the password for an Accountant's Copy working file (.QBA), you will need to type *. * in the file name box and press Enter. This will allow you to see and select .QBA files. IMPORTANT: Enter the correct Company File Admin User Name (if it's different from the name "Admin"). You should now be able to open QuickBooks and log in to your company file using the new password you just set. The password reset tool is a one-time use. The verification form will need to be filled out again to generate a new token. Let's make sure you're able to log in to your QuickBooks Desktop account. John-Pero shared great insights on how you can access your account if your password does not work. If you're having issues signing in to your company file, you can run the Automated Password Reset Tool. You can try the steps he outlined above and see if it works for you. Please be reminded that the sign in page in QuickBooks is case sensitive. Make sure you key in the uppercase and lowercase characters correctly. Go to your QuickBooks Home page, then click the Help menu at the top. Choose QuickBooks Desktop Help from the drop-down. Hit the Contact us icon. I'd be glad to provide further assistance should you have any questions. Best regards!